Timeless is nearing the end. NBC has released the details for the TV show’s upcoming season one finale. 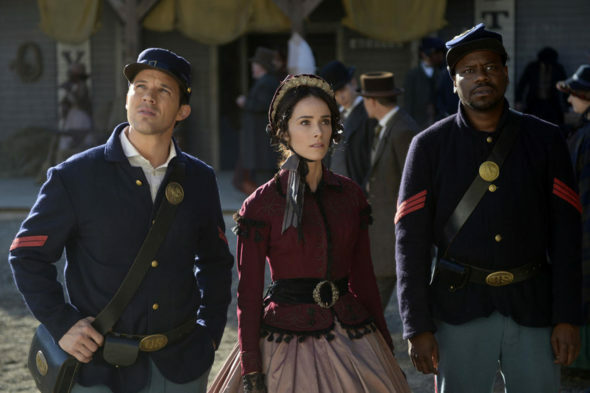 The time travel drama stars Abigail Spencer, Matt Lanter, and Malcolm Barrett as an unlikely team intent on preventing a mysterious criminal (Goran Visnjic) from destroying America. The cast also includes Paterson Joseph, Sakina Jaffrey and Claudia Doumit. So far, season one of Timeless hasn’t earned high ratings for NBC. Currently, the show holds an average rating of 1.19 in the 18-49 demo and 4.976 million viewers. The network has not yet announced whether or not the series will return for a second season. The season one finale of Timeless debuts on February 20th at 10 p.m. ET/PT. What do you think? Do you watch Timeless? Do you want a second season? I love this show! I admit I do not watch any other NBC shows, BUT THIS IS A KEEPER! PLEASE KEEP IT GOING! Please let it continue I love this show!